The MetalWrap Series insulated composite back-up panel eliminates the need for traditional multi-component back-up systems. Features an air and vapor barrier, along with insulation and a metal drain plane in a single-panel design. 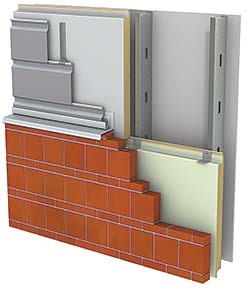 Suitable for exterior rainscreen systems from single skin metal and ACM to brick, terra cotta and others.